The MGP W01 is the first car completely built under Mercedes ownership since the German carmaker left motorsport in the fifties. Its development was led by Ross Brawn and marks the return of Michael Schumacher to Formula One, after 3 years of absence from the sport. Mercedes GP officially launched their 2010 campaign at the Mercedes Motorsport museum at Stuttgart 25 January. While all drivers and protagonists were there, even including Martin Whitmarsh, McLaren's Team Principal, the new car wasn't. The launch was nothing more than a presentation of the new livery. One week later however, the car was rolled out before the start of the first test at Valencia. It was displayed at 9:00 in the pitlane. The new car is a striking difference from the Brawn BGP01, and for that matter also differs quite substantially from the other 2010 cars. The new Mercedes W01 has been worked on by the Brawn team since halfway 2009, and it should come as no surprise that as early as its launch it looked as a well developed car. The W01 made its debut on 1 February that same day at Cheste, Valencia, first driven by Nico Rosberg in the morning and then by Michael Schumacher in the afternoon. 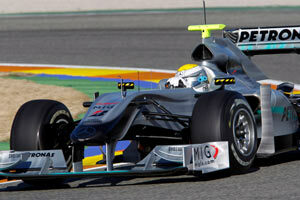 In its striking silver and black, the new nose at first does think about the Brawn BGP01 but is very different from it. The foremost part is much higher above the front wing than before, while the upper sides of the nose are an implementation of the Red Bull RB5 V-nose concept. The car has its nose edge higher at both sides right up to the cockpit opening. The underside of the nose is rounded off, also like the RB5, albeit that the lower front suspension mounts attach to the chassis with a small keel, making this car effectively a single keel, the first we see since 2008. Around the driver, the sidepod entries have changed less, retaining the air inlets that now look bulky compared to what McLaren and Ferrari have presented on their 2010 contenders. The wing mirrors have been kept extremely simple as well. The airbox on the other hand is something unseen on modern F1 cars. Apart from being an air inlet, its main purpose is to be a roll hoop to protect drivers in case of a crash. For that reason, teams usually thicken the airbox' walls with carbon fibre to match the required strength. On the Mercedes however, the concept is completely different. Here the team have chosen to construct the roll hoop as a vertical, thick support right on the centreline of the car. Hence, to also provide an air inlet, the airbox is effectively split in two, with the actual air inlet opening being considerably larger than what it would be otherwise. A little more to the back, there is a small opening on each side of the airbox, providing cooling air for some components that sit more rearward in the car. It is understood that Mercedes and several other teams have chosen to move some components to sit in the low rear to make place for the larger fuel tank. Despite the fairly bulky shape of the sidepods with a remarkable lack of undercut, the rear end of the car is extremely mince, leaving most of the suspension components open to free airflow. The team have made the bodywork so narrow that extra bulges have been added to provide connection points for the pull rods of the rear suspension. Where do we put the obligatory cameras?